Keith Brantly was a member of the 1996 United States Olympic team in the marathon where he finished 28th in Atlanta in 2:18:27 He finished third in the Olympic Trials Marathon behind Bob Kempainen and Mark Coogan with a time of 2:13:22. He narrowly missed two earlier Olympic squads, finishing fourth in the 1992 Olympic Trials Marathon and fourth in the 1988 Olympic Trials 5,000 meters. Keith finished first overall at the 1998 U.S. Marathon Championships in Pittsburgh in his personal best time of 2:12:31. He is the 1995 U.S. 10,000, 25k and marathon champion. In 1989 Keith was victorious at the Gasparilla Classic 15k and Red Lobster 10k. Other top marathon performances include fifth at the 1993 New York City Marathon in 2:12:49 and 20th at the 1994 Boston Marathon in 2:13:00. He is a 1984 graduate of the University of Florida where he finished third in the World Junior Cross Country Championships as a freshman. Keith was the 1982 and 1983 Southeastern Conference 10,000 meter champion and won the 1983 SEC Cross Country title. He graduated from Winter Haven High School (Florida) in 1980 where highlights included a Florida Class 4A State Cross Country Championship in 1979 in 14:18 and a 4A State 2-Mile title in 1980 in 9:13. His personal best times include: 1500 meters – 3:40:00; 5k –13:36; 10k – 28:02; 15k – 42:50 and half marathon –1:01:30. Keith has been inducted into the University of Florida Athletics Hall of Fame, the RRCA Hall of Fame and the Polk County Hall of Fame. He currently works as a Medical Device Sales Specialist for Radiometer America in Jacksonville, Florida. 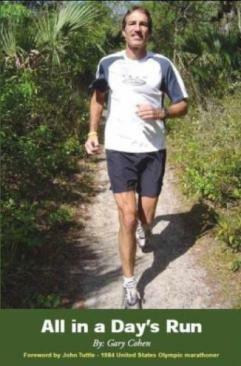 Additionally, he has a website, www.brantlyrunning.com, is a personal coach and motivational speaker. He resides in Jacksonville, Florida and has a thirteen-year-old son, Thor and an eleven-year-old daughter, Ace. GCR: In 1996 you competed in the Olympic Marathon in Atlanta, Georgia. How exciting was it to represent your country on the highest stage? Describe your race strategy that day, how the race developed for you and your performance. KB It was such a relief to actually toe the line at the Olympics. At age 34 it was toward the sunset of my professional racing career. It was a thrill to represent the United States as my entire family was there and it was the realization of a family dream. My race strategy was to put myself in position to finish in the top ten. Realistically, I shouldn’t have had a chance, but I thought by conserving energy it was a possibility. After 13 miles the leaders really took off and I stuck to my plan. Around 15 miles or so I hooked up with a Polish runner and we increased our pace to around 5:10s and passed many runners. I got too caught up in the moment and after about six miles realized we had been running too fast but now it was too late to correct for this strategic error. At one point I may have been as high as 15th place but I faded tremendously in the last two kilometers and was passed by about ten runners. The competition was too deep and good for that kind of a tactical mistake at the Olympics. GCR: At the 1996 Olympic Trials Marathon there were many interesting strategies and developments. Paul Zimmerman built an early lead of over a minute. After the pack caught him around 15 miles the field was whittled down to Bob Kempainen, Mark Coogan and you in the final 10k. The wind, 38-degree cold and hills played a factor. When Kempainen had the upper hand in the final mile, Coogan and you ‘high-fived’ on your way toward Olympic team berths. Discuss your strategy, competitors and the highlights of that race and making the U.S. Olympic team. KB Based on my failure to make the Olympic Team in 1992, I learned that leading a marathon, at least before 23 miles is a futile effort. My strategy at the 1996 Trials was to sit back, draft and stay warm until the final three players became clear. Obviously, the idea was to be in the final three places, but winning would have been icing on the cake. Given my advancing age, 34 years at the time, my opportunity to make an Olympic Team after 1996 would have been slim. Therefore, a conservative race that would keep me in a position to make the team would give me the best opportunity to achieve my goal. Making the team was a huge weight off my shoulders and that of my friends, family and coaches. We had struggled for many years to make the Olympic Team. Making the team at age 34, at least at that time, made me one of the oldest men to make the US Olympic Team in the marathon. GCR: You narrowly missed being an Olympic team member twice previously with fourth place finishes in the Olympic Trials Marathon in 1992 and 5,000 meters in 1988? How disappointing was it to come so close two times, did it inspire you to train with even more focus and was making the team that much sweeter in 1996? KB Certainly the disappointment was huge, but I learned so much from those failures. Those trials and tribulations led to my making the team in 1996. GCR: In 1998 you had a great day in Pittsburgh, winning the U.S. Marathon Championship in a personal best time of 2:12:31. Take us through your race day and also the differences in your race preparation after a torn hamstring suffered the previous year. KB I planned and trained very specifically for the Pittsburgh course. I ran parts of the course several times and trained in the weight room often. In the weight room I primarily did squats with heavy weights. We had some good rabbits to get us through 11 miles, but the pace was too fast. In order to win the bonus of $100K the winner had to run faster than 2:12:51. I was basically leading alone after 12 miles which left me with little choice except to try and stay on pace. My pace started to slow over the last 5 miles but I had enough of a time cushion and hung on to win in 2:12:31. Tactically, it wasn’t a pretty race, but we got the job done. GCR: At age 34 when you tore your hamstring in 1997, did you seriously consider retiring from competitive racing before rehabilitating the injury and returning to intense training? KB Not seriously. I knew I had a few good races left in me. I took off three months totally from running, though I started rehabilitation with core exercises and then progressed to the addition of squats. GCR: The 2000 Olympic Trials Marathon was planned to be your ‘swan song’ as you hoped to make another Olympic team. Even though that didn’t happen, how was it to participate in the Trials for that final time? KB It was bitter sweet. I knew I had no chance to make the team due to another hamstring issue, but finishing the race was a big deal for me. GCR: You raced 2:12:51 at the 1993 New York City Marathon to finish fifth and 2:13:00 for a 20th place finish at the 1994 Boston Marathon. Compare and contrast the two races, courses and spectators. Also, how different was your strategy and tactics in New York versus Boston since at both races you faced many elite runners and ended up with comparable times? KB At the 1994 Boston Marathon I led while at the 1993 NYC Marathon I tucked in back of the elites. At NYC I was very worried about the heat and the course. Based on the 1:01:30 half marathon I ran the previous month I knew I was in good shape. However, in order to run well I had to sit back and let the race play out. At 18 miles I was only in 25th place but I ended up in 5th. At the 1994 Boston Marathon I threw away wisdom, conventional or otherwise, and led through 13 miles. Prior to Boston I had the best training of my life and just knew I could finish in the top five. That’s the difference between being fit enough to win and actually racing to finish high. The two are very different. I bombed out and finished way back in 2:13:00. The spectators were great in both cities and were very excited when I was leading the way early in Boston. GCR: Your first marathon was in Honolulu where you failed to heed advice from veteran marathon racers including Frank Shorter, went out in 1:05 the first half and were humbled by the heat and your inexperience with a 2:20:35 finish. In retrospect, did that day give you more respect for the marathon distance and make you a better marathon racer? KB It did humble me, but I’ve never gone into a challenge with a conservative approach. Life’s not fun if you’re unwilling to stretch the rules a little. I was with the leaders for close to the first half – probably 30 seconds behind the lead pack of Africans. In retrospect I wasn’t strong enough as my longest run was 18 miles and I found it difficult to train much more than 100 miles per week which wasn’t enough to compete at that level. GCR: What were some of the similarities and differences in your training when the focus was on the marathon rather than 5,000 meters and 10,000 meters? What was your typical training mileage? What were some of your favorite track sessions? KB With the exception of the marathon, my training was very standard. When I moved to the marathon I did more mileage and far more tempo runs. One of my favorite workouts was 3 X 2 miles alternating laps of 65 seconds and 70 seconds with a five-minute jog between each 2 mile. When I could complete that workout without having a stroke, I was ready! I liked to mix up my track workouts a lot and often did ‘pace change’ repeats. For example, when doing 400s in 65, I would do splits of 35 and 30 or when doing 600s in 1:35 I would go through the 400 in 65 and drop to a final 200 of 30 seconds. I sometimes alternated ‘hard’ and ‘cruise’ 100s but liked the longer pace changes. This is because during races I liked to surge hard for a minute or more to break my competitors. One Kenyan whom I raced frequently would often do several 100 meter surges which were inefficient. He kept shooting ahead and then coming back. I always thought it was more annoying than strategic when we raced. GCR: How did training in Florida’s heat and humidity affect your training regimen? Did you leave the state to do any altitude training? KB I did own a condo in Boulder, but I mainly trained in hot, humid conditions. Most major championships are held under hot, humid conditions so altitude training was not as beneficial. The years of training in Florida were beneficial to my racing at big races and in the Olympics. GCR: You were coached by David Martin for 16 years post collegiately, John Randolph at the University of Florida and Buck Dawson at Winter Haven (FL) High School. What did each of these coaches do to contribute to your success as a person and a racer? KB High School, Buck Dawson: He instilled a calm, focused approach to my races that allowed me to put aside early losses. College, John Randolph: He instilled the discipline I lacked to work out consistently. This was natural to him as he was a West Point Grad. Post-college, David Martin: He pulled all of knowledge of exercise science and racing skills of the world class runners he had come to know over the years to help me improve. He helped me go from a talented runner to a seasoned competitor. GCR: With the luxury of hindsight, is there anything you could have done differently in training and racing focus that may have resulted in better performances? KB I would have started training with elite runners much earlier in my career. There are two reasons for this – to help me to develop mentally and to share the intensity of training. You have to train with those who are far better than you in order to improve. It is much more important for the tough workouts. The top runners tend to get the most benefit, though the lesser talented runners in a training group have the potential for the most improvement if they really take care to avoid injury. GCR: Who were some of your favorite competitors and adversaries from your professional career, collegiate days and when you first started in high school competition? KB High School: Basil Magee from Largo High School as we were very close in ability and competitiveness. In the fall of 1979 we ran together in the 2-Mile Postal Meet in which high school runners from all over the country competed as teams and individuals with results compared nationwide. We helped each other until the end when he outkicked me in 9:02 to my 9:03. His shoes shot sand into my face due to his great leg power. Amazingly, he never wore spikes! College: My teammate at UF, Mark Sheehan, who wasn’t as fast as me but helped push me in workouts. Mark wasn’t as fast as me as he dipped just under 29 minutes for 10k after college and was a solid 14 flat 5k racer but he absolutely killed me in workouts. We worked together on intense days and he helped me run a bit faster on easy days when I felt like running way too easy. He ‘forced’ me to run faster and even got me out on some days when I felt like skipping a run. Training together helped both of us equally. Professional: Ashley Johnson, John Rogerson and John Treacy (but only when John was old; he was too good when I was young). John Rogerson was fun to race with and was a bit of an anomaly since he left the Navy and was a 27 year old freshman. Possibly my favorite race ever was the Wendy’s 10k in Bowling Green, Kentucky when Ashley Johnson and I pushed each other the entire way. I believe it was in 1985 on that difficult course and he was the local favorite since he was a Western Kentucky graduate. Either one of us could have won but I beat him by one second. Even though Ashley lost, if you asked him today I bet he’d say it was one of his favorite races too. GCR: You finished in third place at the 1981 World Junior Cross Country Championships and took home gold at the 1985 World University Games 10,000 meters. What was your strategy in both of these races and what stands out as highlights of each? KB At the World Juniors my goal was to stay as close to my teammates as possible. We had a very talented team, including George Nicholas and Chris Hamilton, and I knew if I stayed close to them, I would run well and we would place high in the team rankings. Anyone on our team could have finished in the top three; I was just the lucky one. Honestly, winning the team title was far more important to me than my individual place. It was surprising to win the team title though we were fortunate not to face Kenyan or Ethiopian teams like the strong teams now. However, the Canadian, British and Italian tam had some great runners. England’s Jack Buckner stayed at my home once while in high school and went on later to race 13:06 for 5k. One Italian later got his 10k time down around 27:20. The World University Games was my favorite track victory as it came down to a very fast last 400 meters in which I barely won with a 56 second last lap. My fastest 400 meters ever was a 52 second time trial in college so I wasn’t a speedster. But I had the ability to accelerate very quickly and, if I was with someone, I could to my top end speed fast - but only for a short burst. Luckily, it worked at Worlds. GCR: While at Florida you won two Southeastern Conference 10,000 meter championships and one Cross Country title. How important were these SEC titles to you and what are your main memories of your tactics and competitors? KB The cross country race was very difficult as the field had so many good athletes from the mile to 10K. The University of Florida places a high emphasis on the SEC so winning was a very big deal. The two 10,000 meter track races were both ‘sit and kicks.’ The most memorable was the year Georgia hosted the meet in Athens and the race played right into my hands. I raced Mark Plaatjes, passed him with 200 meters to go and then cut into lane one around the curve to start my final kick. Around the steeplechase pit I surprisingly felt someone on my left and it was Mark trying to pass except he was inside the track. I accelerated and still won and he ended up getting disqualified even though he was a clear second place. I don’t know to this day what he was doing. GCR: Your big individual success started with winning the 1979 Florida Class 4A State Cross Country Championship in 14:18 and the 1980 State 2-Mile title in 9:13. How tough were these victories, who pushed you and what separated you from your competitors? KB In cross country, Basil Magee of Largo had been beating me all season. He had a great kick and I couldn’t beat him in a dead sprint. Our only option was to take him out very hard and run up a huge lead. This worked out very well, but I wouldn’t recommend that strategy for everyone. Basil was a great miler and at the 1980 State Track Meet he ran a 55 second last quarter to win in 4:09 while I faded with ‘only’ a 63 second lap to place third in 4:17. The two mile was a more tactical race, but again, I didn’t wait very long to put the race away. Basil didn’t run it which was fine with me. GCR: What was your training like in high school through the summer, cross country season, winter and spring track season? What were the major changes when you matriculated to college? KB I was mainly a lower mileage runner, except for the summers. We put in 60 miles per week during the summer. Track season involved two interval workouts per week along with the standard racing season. Higher mileage and training with better athletes drove most of my improvement in college. GCR: The ‘Keith Brantly Legend’ has you slicing your heel in a boating accident at age 11, doing some running a couple of years later and then getting more involved in the sport at the suggestion of your doctor. How does the legend compare with reality? Did you take to running like a duck to water? Were you successful in other youth sports? KB The legend is true; I did nearly lose my entire heel due to a boating accident. However, I started sailboat racing shortly after the accident because I could get away with not using my foot. Running was very natural to me, but I mainly used it as a technique to avoid my older brothers. It wasn’t until I was invited to a local road race around the age of 13 that I really started to love the idea of competition. Other sports that did not involve a ball, like water skiing, sailing, and surfing were the only sports in which I participated. GCR: For several years you have coached others and helped them to strive toward reaching their athletic potential. How rewarding is it to help others succeed compared to your own personal accomplishments? How much more difficult is it to instill in others the necessary discipline, focus and mental toughness? What are your thoughts on rest and recovery in training? KB I enjoy watching others succeed more than relishing my own success. I was blessed with great tools and great guidance for which to use that talent. Many of the runners I coach make up for any lack of raw talent with discipline and a systematic approach to training. In fact, most of the runners I coach are far tougher and focused than me. I have to hold many of them back because they desire to improve so much so that they are risking injury. My Coach, Dave Martin, helped me understand that ‘Rest is Training.’ He emphasized that true adaptation from hard training doesn’t occur until you allow your body to recover. An analogy is a wound must heal for the skin to become strong once again. GCR: What have you found is similar and different in coaching elite athletes versus average runners and novices? Do you like coaching any particular age group gender or distance? KB There are more similarities between elites and recreational runners with respect to goals and drive. The only differences I’ve truly seen could be the luxury of time elites can devote to training and recovery modalities vs. average recreational runners. I like the variety of coaching athletes from high school up to Masters competition. The mindsets are different and they present varying challenges. GCR: What are some of your goals for the future in terms of fitness, coaching and the possibility of age group competition? KB My goal is to move into full-time coaching and compete as a master. I’d really like to compete in the mile as I don’t have to invest so much time in training. Once I get in shape for mile racing I just have to stay healthy. Also, training for and racing the marathon isn’t as much fun. GCR: When people think about Keith Brantly, what do you hope comes to mind? KB An out-going, caring, fun-loving, tough competitor. Favorite books ‘The Perfect Storm’ and any book on sailing. Embarrassing moment Kim Pawelek and I were invited runners for the 2007 Naples Daily News Half Marathon. The race organizers provided amenities including complimentary hotel rooms. Several days ‘before’ the race I noticed some recent race results which included the 2007 Naples Daily News Half Marathon – oops, we thought it was the next week and missed it!